SAVE THE DATE! Enjoy the last days of summer this Labor Day Weekend at Bedford Winery Courtyard for our annual WINO Radio Dinner Show. 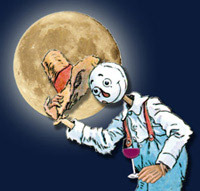 Amazing blue grass music, comedy skits, great food, fantastic wine! See Events for more information. Join us for a wonderful summer evening of authentic Vera Cruz music (Grupo Sol Y Mar) and cuisine. Free entrance for music with wine tasting or wine by the glass. For the full enchilada which includes foods of Vera Cruz from seafood delicacies to roasted corn with chorizo butter, it is $20, $15 for Wine Club members(includes glass of wine). For more information, see our Events page. It’s been a while since I chatted with winemaker Stephan Bedford at Bedford Winery. On a recent jaunt to wine country, I didn’t make any appointments and just decided to wing it and walk into tasting rooms just like any regular wine country visitor. As I took my 60-second driving tour of downtown Los Alamos, I spotted a working pickup truck with the Bedford Winery logo, across the street from the tasting room (448 Bell St., Los Alamos, CA 93440, 344-2107, open daily 11 a.m.-5 p.m.). • Bedford Chenin Blanc, Santa Barbara County 2010 ($25): Chenin blanc is such an underappreciated grape (Foxen puts out a great version) that it’s refreshing when the grapes, from the old Firestone vineyard, get into the right winemaking hands. Bedford’s 2010 was barrel fermented but in older, neutral oak for 24 months, and that seems to add an overall richness to the wine. Yellow apple with apple pie baking spices come through on the nose, while apple, pear and melon fruit seem very creamy on the palate. Part of that is due just to the nature of the grape but the barrel treatment certainly amplified the effect. It’s not really a mouth-filling wine, as in big and bold. Rather it’s delicate and elegant while still retaining all the varietal oomph it should. Crisp and well balanced, it does a lovely slow fade of flavors on the finish. • Bedford Chardonnay, “Dear Prudence,” Santa Barbara County 2009 ($35): Now this chardonnay is bigger and has a littler more edge to it than the chenin blanc. It’s essentially a barrel selection of three of the best chardonnay barrels, aged for 20 months, 30 percent in brand new French oak. Apple, pear and a little peach are apparent on the nose. In the mouth, the immediate sensation is rich and viscous. Apple and pear fruit flavors make an appearance again along with barrel spice; it turns creamy on the mid-palate with, by turns, fresh toast and brioche dough integrated into the fabric of the wine, making it that much richer and quite a bit more complex. Medium bodied, it finishes vigorously with fine and appropriate trailing acidity. This bottling is dedicated to Mr. Bedford’s dear, departed mom. • Bedford Carignane, Santa Barbara County 2009 ($30): Again, much like chenin blanc above, you don’t see much varietally labeled carignane; most of it is buried in Rhone-style blends. But, once again, in the right hands and treated with the respect it deserves, carignane can really sing. The grapes came from a vineyard in Santa Ynez Valley, where they were harvested in the cool of the night, then pre-fermentation cold soaked for 72 hours and allowed to macerate and ferment for 30 days. The result is plenty of red fruit on the nose, including strawberry, cranberry and cherry. The light color of the wine is a precursor to the lighter and more delicate flavors to come. Strawberry, cranberry, pomegranate and cherry jello are prominent and even a little blueberry sneaks in the back door. It acts like a fairly simple quaff at first but it really pops in the mouth with bright and sunny flavors. Even after 30 months in Minnesota (!) oak, it’s still very fresh and upbeat with some nice, polished wood spice on the long finish. • Bedford Syrah, Comet (17P) Holmes, Santa Barbara County 2007 ($30): This special syrah release commemorates the visit of Comet Holmes during the 2007 harvest. The comet was temporarily the largest object in the night sky during the harvest and clearly visible to the naked eye. Quite an unexpected phenomena, according to Mr. Bedford. So, too, this syrah was surprising and unexpected. He blended a number of different barrels from different vineyards to come up with something he felt was special. On the nose, plenty of dark plum, black fruit, cigar box and a delightful unexpected floral component that lifts the fruit aromatics up. That bit of floral hits the palate even before the red raspberry, cranberry and red plum fruit come into focus, also aided by clove and bit of toast. Then the fruit flavors really take over deep into the mid-palate with the aforementioned red fruits all the way to the dark fruits of plum and blackberry. A sensual syrah tour de force, to say the least. • Bedford Grenache, Special Select, Santa Barbara County 2010 ($35): The first red Bedford release from the 2010 vintage, this grenache is comprised of three select barrels that showed the best promise. After two years aging in neutral oak, it’s showing plenty of red fruit from the git-go on the intriguing nose. Flavors follow the same path, with cranberry, strawberry and pomegranate (you can almost chew on the seeds!) very prominent. It’s the youngest and most highly structured wine in the Bedford lineup and is quite thick, like jam or preserves, in the mouth. It comes across as a little brash but it opens up as it sits in the glass with a spicy and tangy lilt, in addition to the fruit becoming more generous. Decanting is recommended at this point to bring out all the elements built into the wine, or just throw it into your cellar for two or three years and revisit something a bit more glorious. Wine expert Dennis Schaefer’s column appears every other week in the Food section. Email him at food@newspress.com. For Bastille Day, come on by for some all American, old timey music at the Bedford Tasting Room Courtyard from 2-5 pm. No charge for those who winetaste or have wine by the glass. If you enjoyed the music from the movie ‘O Brother Where Art Thou,’ you’ll love this! Musical group Chicken Liquor (formerly Triple Foot Chicken) will perform. You are currently browsing the Bedford Winery blog archives for July, 2013.